Writing about food can be fun because you get to share your thoughts and feelings about something you like. You may like something your parent or grandparent makes, or you may have a favorite food from a restaurant. Here is one writer’s food review. My mom’s cheeseburgers are the best. She starts with ground beef from Matt’s Butcher Shop. His ground beef is fresh and has the perfect ratio of meat and fat for flavor. Then my mom grills the meat because she says it is a healthy way to cook. But it is more than that. 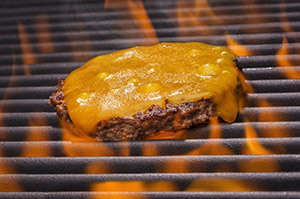 Grilling keeps the burger really juicy and locks in the flavor. Next, she places a piece of cheese on each burger. She always makes sure the cheese is melted perfectly. Right at the end, she puts each burger on a bun. But instead of ordinary soft buns, she uses bakery hard rolls. I wish I were biting into one right now. In her review, the writer elaborates or includes added detail (in italics) to make each main point clear and effective. Your Turn Write a review of a favorite food or meal. Decide how you want to describe the food. The writer above tells, step by step, how the food is prepared. You could also describe how it looks and tastes. List details to include in your review. Write your review. Look for places where you can elaborate or add special details. Share your final copy with your classmates. Elaborating in a Food Review by Thoughtful Learning is licensed under a Creative Commons Attribution-NonCommercial-ShareAlike 4.0 International License. Based on a work at k12.thoughtfullearning.com/minilesson/elaborating-food-review.